Not long ago, the phrase "counterfeit Burberry" was practically a tautology. The brand's trademark nova check was copied on everything from cookies to credit card covers, and the pattern became so associated with chav culture that the company decided to downplay it for a while. All is not quiet on the tartan front, however. Another venerable outerwear company, newly rescued from bankrupcy by Iconix, has decided that a bit of plaid is just what it needs to become a "premier global lifestyle brand." In London Fog's new ad campaign, trenchcoat-clad actors Kevin Bacon, Cheryl Hines, and Teri Hatcher flash their plaid linings in support of Bacon's charitable networking site, SixDegrees.org, and their own favorite causes. Burberry, however, is not amused. In a complaint filed last Friday in federal district court, the British brand charged its American counterpart with not only infringing the iconic check but also imitating Burberry's products and ad campaigns and even lifting copyrighted images for use in advertising materials. Iconix responded with a statement denying the allegations and adding, "Plaid designs have been a common element of London Fog products for years." So, trenchcoats and tartan. Hardly original works -- or are they? As everyone from Victor & Rolf to Gaultier has proven, the humble trench can be the starting point for extraordinarily original garments. 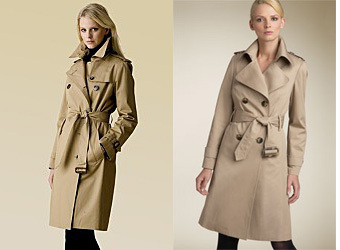 While the Burberry trench is the cornerstone of the house, however, the classic version offered by both Burberry (left) and London Fog (right) is a standard fashion basic. What, then, of plaid? How unique is the Burberry check? It's certainly a registered trademark, and widely recognized as such. Beyond that, I'll leave you to read paragraph 11 of the complaint for a detailed description or, if you prefer a more tantalizing tour of tartan, the forthcoming book from designer Jeffrey Banks. With over 3,500 official Scottish tartans and a potentially infinite number of other plaids out there, what are the odds of the same one appearing twice -- even assuming there's some unofficial affinity between tartan and trenchcoats? One thing's for sure: If Burberry and London Fog proceed to trial, that classic scarf at the bottom of your sock drawer could provide an easy escape from jury duty. Thanks to Sally and Anonymous for the tip!